Just because they're manual, doesn't mean they're not fast and easy to open. Look for the FLIPPER symbol for knives with a built-in flipper that makes opening as simple as a push on the flipper or a quick flipper push combined with and a roll of the wrist. 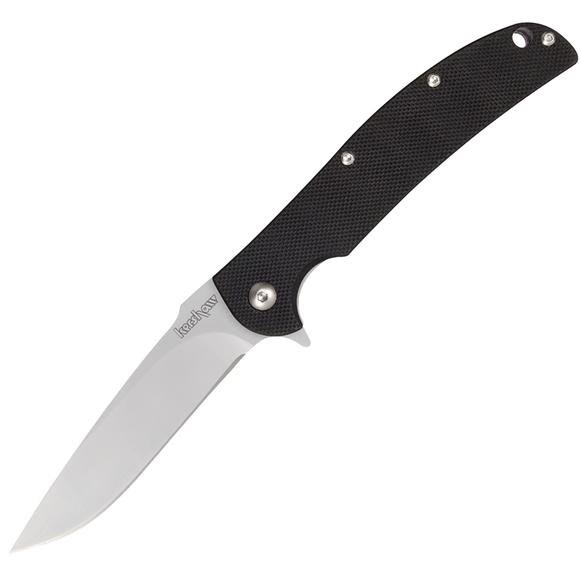 Kershaw's Chill offers clean lines and cool performance. Just because they&apos;re manual, doesn&apos;t mean they&apos;re not fast and easy to open. Look for the FLIPPER symbol for knives with a built-in flipper that makes opening as simple as a push on the flipper or a quick flipper push combined with and a roll of the wrist. Kershaw &apos;s Chill offers clean lines and cool performance. Designed by RJ Martin, the Chill is a gentleman&apos;s folder with a matte-finished blade that comes razor sharp right out of the box. To make manual one-handed opening easy, it features an ambidextrous Flipper. CNC-machined G-10 handles finish the Chill off right and make it a lightweight EDC. Includes pocket clip. Locks the blade open during use; one side of the knifeÕs steel liner, the steel plate to which the handle scales are attached, moves into position behind the blade to securely lock it open. May be used on either manual or assisted opening knives. The flipper is a protrusion on the back of the blade that the user can pull back on, or flip, in order to move the blade easily out of the handle. Overall Length 7", closed: 3 7/8"